Egypt continued to dominate the 2018 Youth Olympic Games as Ahmed Elgendy proved his status as the best young pentathlete in the world. Only 24 hours after his compatriot Salma Abdelmaksoud won the Women’s Individual crown, Elgendy (EGY) continued his extraordinary run of success in 2018 and lived up to his billing as the favourite to win the Men’s Individual title. 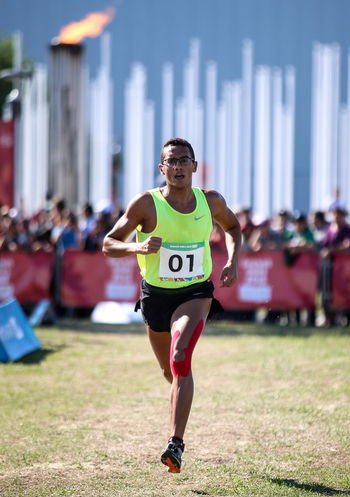 The 18-year-old Elgendy (EGY) has been unstoppable all season, becoming world champion at both the UIPM Junior and Under 19 Tetrathlon World Championships among various other accomplishments. 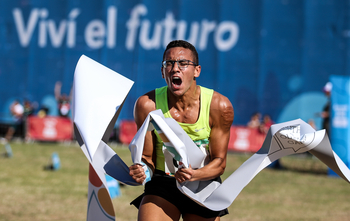 He once again mastered the Tetrathlon format in Buenos Aires (ARG), finishing 2nd in Swimming and 1st in Fencing before defending his lead without alarm in the Laser Run. Behind him, Egor Gromadskii of Russia was equally convincing in the way he captured the silver medal, while Ugo Fleurot of France prevailed in an intense battle for bronze. Elgendy (EGY) said: “Of course I’m feeling great, feeling proud to be the Youth Olympic champion. It’s been my dream for four years. 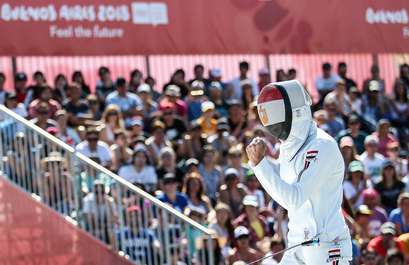 The triumph of Elgendy (EGY), following the less anticipated victory by Abdelmaksoud (EGY), continues a strong run of success for the development system created by the Egyptian Modern Pentathlon Federation. Egypt had never previously won an Olympic or Youth Olympic medal and now they have two golds, with Elgendy (EGY) following in the footsteps of 2010 champion Kim Dae-Beom of Korea and 2014 winner Alexander Lifanov (RUS). Apart from his coaching team, Elgendy (EGY) paid tribute to the other people who helped and motivated him to achieve his Youth Olympic dream as he looked ahead to the International Mixed Team event which will conclude the Games in Buenos Aires (ARG). “My mother is here and she came to support me and motivate me and I would like to thank her very much,” said the new champion. “My heroes in pentathlon are Aya Medany from Egypt, also Alexander Lesun from Russia – I hope I can compete with him in Tokyo in 2020. Silver medallist Gromadskii (RUS) said: “This feeling is amazing, I can’t describe it. The best discipline I did was Fencing; I didn’t do quite so well in Swimming but in the Laser Run I think I had a great performance. 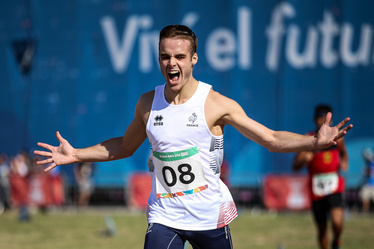 Bronze medallist Fleurot (FRA) said: “I feel very good that I took the bronze – I don’t believe it, it was incredible. “All the race I said in my head ‘I don’t want to finish 4th, I don’t want to finish 4th, because three times I finished 4th including the World Under 19 Championships in Caldas da Rainha. In the last lap I sprinted and I took the bronze. “My dad and my mum are here today and my dad always comes with me – it’s for them. Now it’s time for the International Mixed Teams and it will be very good because it’s not the same competition – it’s more about friendship. 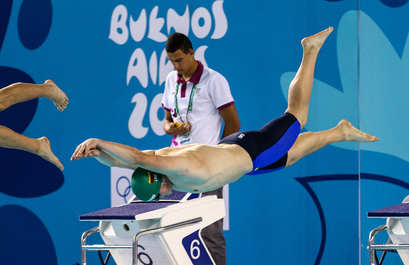 Argentina fans once again provided huge vocal support for all athletes, and especially local hero Franco Serrano who recorded the 9th-fastest time of 2:07.59 in the pool at the Natatorium. Elgendy (EGY) and Gromadskii (RUS) put a marker down as the men to beat with their strong performances in the Fencing Ranking Round, where both scored 18V/5D in their 23 bouts. Yevhen Ziborov of Ukraine was next-best on the piste with 16V/7D, one victory ahead of Uibel Pele of Germany and two ahead of Dora Nusretoglu of Turkey and Uladzislau Astrouski of Belarus. The star of the Bonus Round was Kamil Kasperczak of Poland, who added five points to his overall score and gave himself 5sec additional time to play with in the Laser Run. Elgendy (EGY) was the last man standing, adding two points to his tally. Elgendy (EGY) and Gromadskii (RUS) were separated by 11sec at the start line and it was another 18sec until Ziborov (UKR) would start, so the two leaders knew they only had to keep calm under pressure to reach the podium. The only real battle was for bronze, involving Nusretoglu (TUR), Fleurot (FRA), Pele (GER), Malan (ITA) and Astrouski (BLR), and after an excellent 3rd shoot it was Fleurot (FRA) and Pele (GER) who gave themselves breathing space. 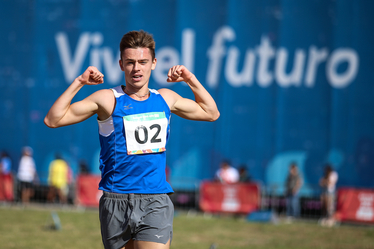 They arrived and left the range together for the final time, but Fleurot (FRA) had the superior kick and moved away from his rival in the final 200m to secure the coveted podium position. UIPM President Dr Klaus Schormann said: “This was a very special day with many wonderful moments, especially in the Laser Run where many people said it was the most exciting Laser Run they had seen at youth level. “There is such a high quality in our young athletes and they have so much spirit. We hope they can take a lot away from this experience and we are looking for them to become top pentathletes in the future. 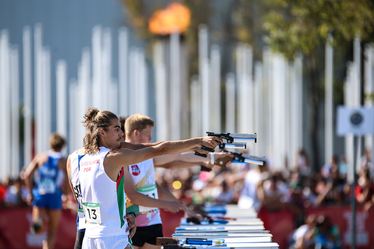 The 2018 Youth Olympic Games pentathlon competition continues on October 15-16 with the Mixed International Team competition. This is the only time at a global pentathlon competition that athletes are drawn from different nations and invited to team up, allowing cross-border unions to form in a spirit of solidarity and collaboration. Visit the Buenos Aires 2018 website for all results.